This is the deadliest form of skin cancer that develops in the melanocytes which are pigment cells present in the skin. Melanoma develops when unrepaired DNA damage caused by the sun's ultraviolet rays or tanning beds triggers a genetic defect or mutation. This mutation causes the skin cells to multiply rapidly forming malignant tumors. Melanoma can also form in the colored part of the eye and very rarely internal organs like the intestines. Melanoma occurs when there are changes in pigment producing cells of the body called melanocytes. Melanocytes produce melanin which is responsible for skin and hair color. These changes disrupt the orderly manner in which skin cells form (new skin cells push older skin to the skin surface which die and fall off) and make the skin cells grow rapidly and out-of-order. The disorderly skin cell formation is what eventually develop into a mass of cancerous tissues. Melanocytes produce melanin which is responsible for skin and hair color. Melanoma often begins as a mole but it may also come in the form of a skin discoloration (red, pink, blue, purple or white). 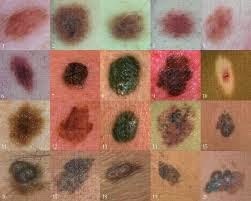 Melanoma has 5 stages. Staging is based on thickness of the lesion, depth of penetration and how far it has spread. Stage II - This has 3 subclasses. It is characterized by the tumor thickness and the status of ulceration. There is usually no distance or lymph node metastasis at this stage. Stage III - This stage has 3 subclasses and its characterized by lymph node metastasis. There is no distant metastasis at this stage. Treatment of melanomas depend on the stage of the cancer, your age and other medical condition. Usually early detection requires surgery to remove the cancer and surrounding tissue. The depth of the cancer is taken into consideration when removing the surrounding tissues. If the cancer has spread to the lymph nodes, they will be taken out. Surgery is normally the only type of treatment required for early melanomas. Chemotherapy - These drugs can be given intravenously, in the form of a pill or where necessary both ways. Chemotherapy kills the cancer cells. Radiation - These use high energy beams to relieve pain and discomfort caused by cancer that has spread. Biological therapy - Medications like interferon or interleukin are used to boost your immune system to fight the disease.